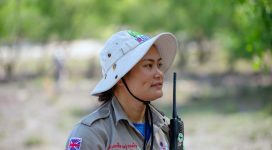 EOD Team Leader Hoang Duc Long investigating the marked location where tubes of cluster bombs are found by members of the Cluster Munitions Remnants Survey team. 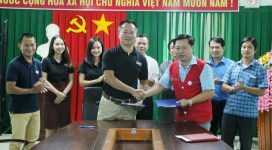 Cam Lo, Quang Tri (01 June 2016) – In a couple of weeks, farmers in Vinh An Village of Cam Hieu Commune will start their new rice crop. It is a common sight to see smoke rising from rice paddy fields here as people are burning leftover straw before water is pumped in for plowing. Heat from burning straw could detonate unexploded ordnance that remains in the field. A potential accident was prevented on Monday when Project RENEW team found and safely removed more than fifty cluster bombs just under the surface. On Monday morning, members of the Cluster Munitions Remnants Survey Team (CMRS) No.9 uncovered some tubes that contained unexploded cluster munitions while conducting technical operations to map out contaminated land for clearance. The tubes were exposed at the depth of 30cm, according to CMRS Team Leader Hoang Dinh Trieu. Marking the location with red warning tape, Team Leader Trieu coordinated with the EOD Team No.3 for a follow-up response. 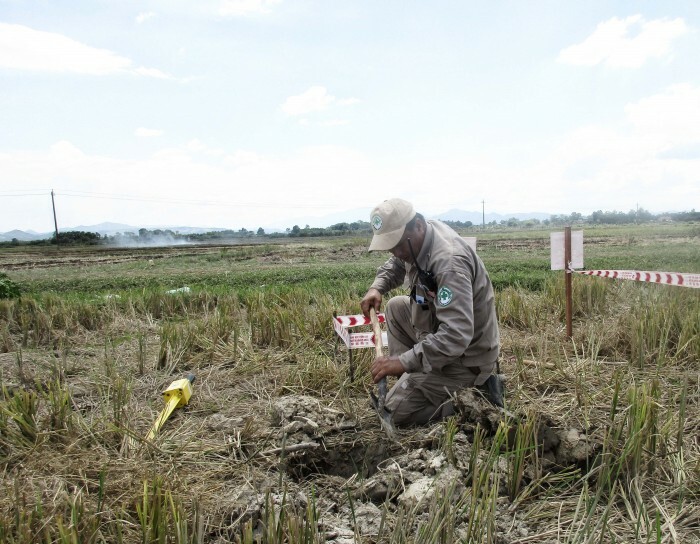 In addition to providing quick response to UXO discoveries reported by local people, RENEW’s EOD teams are responsible for destroying cluster bombs and other munitions located during the technical survey process. Upon arrival, EOD team members set up a safety cordon around the location and Team Leader Hoang Duc Long started his investigation. Further excavation resulted in four tubes of different lengths being exposed. The tubes contained as many as 55 items of deadly cluster bombs, identified as BLU-24 type cluster munitions, or “orange bombs” as called by local people, according to National Technical Bui Trong Hong. Aluminum tubes of SU-14/A dispensers which contain BLU-24 cluster munitions are found 30cm under the surface. 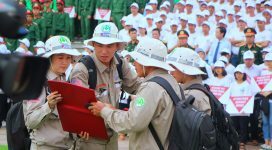 Since March 2016, RENEW’ CMRS teams working in Vinh An Village have processed more than 1.6 million square meters of land and found 345 cluster munitions and 32 items of other weapons. 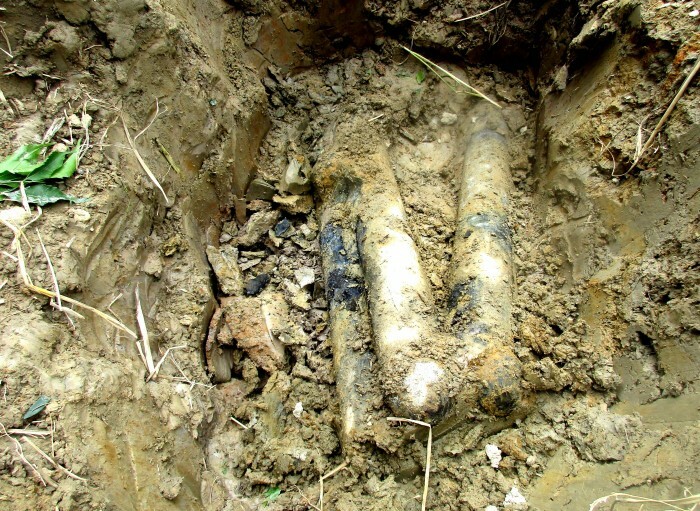 It is quite rare for Project RENEW teams to find intact tubes with cluster munitions inside. In August 2009, in response to a UXO call-in reported by local people, RENEW EOD team safely removed five intact tubes comprised of approximately 100 to 120 cluster bombs of the same type, BLU-24.